Oops - we don't appear to have a video for the fi-4860C2. 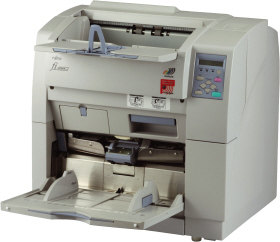 The Fujitsu Fi-4860C2 document management scanner can scan in colour and mono at speeds of 60 pages per minute at 200 dpi (via an ultra wide SCSI EGSA board) through the automatic document feeder, and also has manual feed capability. It can scan from A7 up to A3 and is equipped with a 500-sheet hopper.